* The JGVP01 Vacuum Pump is required for oil analysis kits. The JGVP02 Vacuum Pump is required for coolant analysis kits. Vacuum pumps are reusable. Only need to buy once. May be used for engines, transmissions, gear boxes, differentials, or refrigerator truck circulation motors. 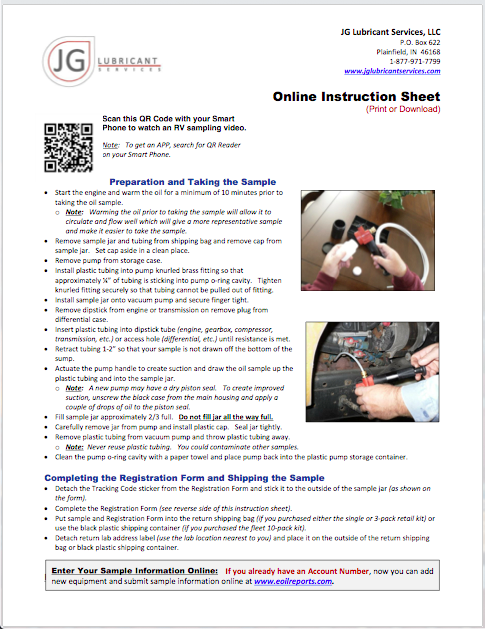 Includes all of the tests included in the Basic Oil Analysis Kit plus TBN (Total Base Number) for engine oil samples, TAN (Total Acid Number) for non-engine oil samples and Oxidation/Nitration. Recommended for Heavy Duty fleet analysis where filtration information is also required. Includes all of the tests included in the Advanced Oil Analysis Kit plus an evaluation of either iron wear or general system debris. Note: Testing performed to evaluate system debris and/or iron wear is based on component type and/or oil type (see System Debris definitions below). Where filter media size is known, the kit can be used to evaluate whether or not filters are providing expected filtration by measuring system particles and them to filter media size. As with the Advanced Oil Analysis Kit, this kit may also be used to extend drain intervals in addition to measuring system debris. Particle Quantifier (PQ Index) - Engine oil samples receive Particle Quantifier testing with "PQ Index" reported. The Particle Quantifier exposes the oil sample to a magnetic field. The presence of any ferrous (iron based) metal causes a distortion in the field, which is represented as the PQ Index. PQ Index correlates well with Direct Read Analytical Ferrography (large). PQ does not provide a ratio of small to large ferrous particles; however, if the PQ Index is smaller than the Iron as shown in the ICP wear metal data (ppm), then it's unlikely there are any particles larger than 10 microns present in the sample. If the PQ Index increases dramatically while the ICP Iron data (ppm) remains constant or decreases, then it's likely that larger iron particles are being generated and add-on Analytical Ferrography testing may be recommended. 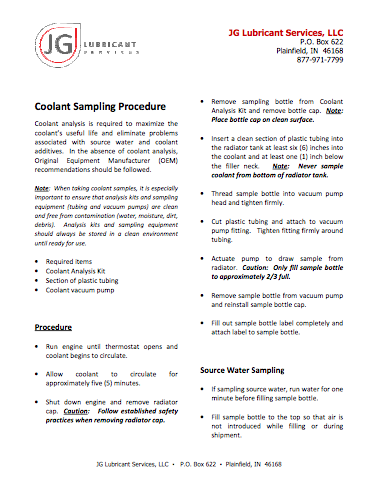 Particle Count and ISO Cleanliness Code - Non-engine samples from filtered systems, such as hydraulics, turbines, compressors, automatic or power shift transmissions, recirculation systems and gear systems (with a fluid viscosity of less than ISO 320) will recieve Particle Count testing and a calculation for ISO Cleanliness Code (per ISO 4406). The unit of measure is for Particle Count is (#particles per milliliter). Results are reported in the following micron size ranges: >4 µm, >6 µm, >10 µm, >14 µm, >21 µm, > 38 µm, >70 µm and >100 µm. ISO Cleanliness Code is a unit-less number based on the Particle Count results in the 4, 6 and 14 µm Particle Count ranges. For example, an ISO Cleanliness Code of 19/16/13 means the sample contained between 2,500 and 5,000 particles >4 µm, between 320 and 640 particles >6 µm and between 40 and 80 particles >14 µm.